With Women’s Day right around the corner, ASUS, the Taiwanese leader in mobile technology, today announced a special surprise to celebrate the women of the country. 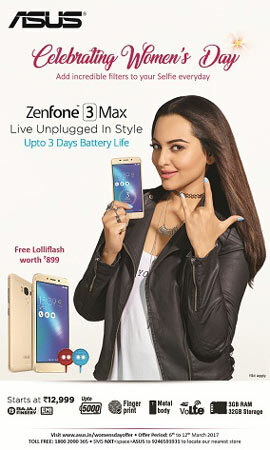 Female customers will be given a Lolliflash worth Rs.899, the perfect photography accessory for a smartphone, absolutely free with every purchase of a Zenfone 3 Max series Smartphone – Zenfone 3 Max 5.2, Zenfone 3s Max or Zenfone 3 Max 5.5 (ZC520TL, ZC521TL, ZC553KL respectively) between 6th and 12th March 2017 or till stocks last, whichever is earlier. One of the most unique accessories from the ASUS product portfolio, Lolliflash is a lollipop shaped dual-tone LED torch that improves the quality of low-light photos and videos taken on a smartphone or tablet. Available in 5 cool colors- White, Blue, Black, Red & Yellow, the Lolliflash acts as a separate ‘fill-in’ light, delivering true to life visuals. Weighing only 8 grams, it is extremely portable with a built-in battery that lasts up to three hours. Lolliflash has different color filters – White, Blue and Red, three brightness level settings and Anti-Red-Eye to further enhance the photography experience. The Zenfone 3 Max series – Zenfone 3 Max 5.2, Zenfone 3s Max and Zenfone 3 Max 5.5, perfectly combine elegant aesthetics with powerful performance. Zenfone 3 Max series smartphones are packed with class leading features and functionalities such as premium sleek metal body, 4100 mAh / 5000 mAh battery that lasts up to 3 days and with reverse charging capability, extremely responsive fingerprint sensor that registers up to five separate fingerprints, and accurately detects fingerprints regardless of the orientation of the finger, 3GB RAM and 32 GB Storage and VoLTE support. Disclaimer: This is only valid for the purchase of a Zenfone 3 Max from ASUS Authorized Partners between 6th and 12th March 2017 or till stocks last, whichever is earlier. Customers are required to register the product purchase details, upload a copy of the invoice and enter the contact details on www.asus.in/womensdayoffer latest by 25th March 2017. The Lolliflash will be dispatched to the customer’s registered address by 1st April 2017 and delivered within 10 working days from the date of dispatch. This is open to Indian residents in India only. Non-resident Indians/ non-citizen Indians not residing in India are not eligible.